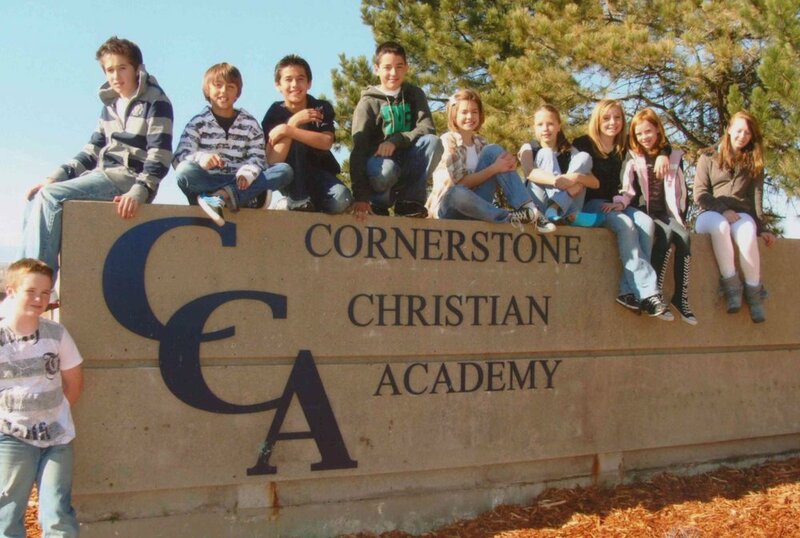 Twenty-one years ago Cornerstone Christian Academy was founded by a group of parents seeking a strong independent Christian school in a community that didn’t have one. From the very beginning the endeavor was a walk of faith. In this blog we’d like to share with you the amazing ways Jesus Christ began and has carried on this school. It’s here you’ll learn about our history as we share our story. Our story that is all His. This post will feature several storytellers. Story shared by Kathy Beach, a CCA founding parent and teacher. Faith Bible Chapel North announced after 2 years of hosting and supporting Rocky Mountain Christian School (CCA), they were not able to continue due to the financial strain. A group of parents, headed up by Peter Fetterly, had a meeting and acknowledged we had a good start on a school, we had a great staff, and we didn't want to see it come to an end. This group decided to try to make a go of it without the support of a church, which had never been done in the area, as far as we knew. The staff was asked if they would step out in faith and pledge to teach the next school year if we could find a location to meet. The entire staff agreed, even though there wasn't any guarantee on salaries for the next year. That took faith on their part, and Cornerstone Christian Academy was officially an independent school! One afternoon in 1998, Mary Fetterly and I got in the car and started to drive around in the north area and try to identify some potential sites for our school. We went to several churches. Some were not anywhere acceptable for our needs, and at some churches, the staff we encountered were not open to even entertaining the possibility. As we drove west on 120th and passed the Arabian Horse Center, Mary said to me that that was the place she envisioned our school making it's home. I, on the other hand, was skeptical, and the possibility of it seemed too out of reach. Ye of little faith! We went on to have school at New Life Church and Harvest for the next several years before God opened the doors for the Arabian Horse Center to be our new school home. I believe that God put the AHC on Mary's heart because He already had it in the future plans for CCA! He was just giving her a preview of what He would and could accomplish for our faithful little band of parents who wanted to offer a Christian environment for our children. Story shared by Leah Mangel, a founding family and staff member since 1996. Everything about CCA from the beginning until now has been a journey of faith, a heart calling, and ministry to those who have been willing to serve no matter what that looked like. The challenge of finding a building and all that entails was quite a process. It took so many faithful, generous, and hard working hands who were willing to invest their time, treasure, and talents. Some of these works of the heart included, but were definitely not limited to: wallpaper stripping, tearing down walls, rebuilding new ones, painting, carpeting, cleaning, giant garage sales, building a playground, fundraisers, celebration dinners, chili cookoffs, CCA “Heart Attacks,” endlessly setting up chairs and tables and tearing them down and setting them up again, Valentine’s Day Extravaganzas galore, more fundraisers, Bulldog athletics, championship teams, volunteers pouring out their time and talents and so much more! Most of all, these years have built not just a school, but a foundation of God’s faithfulness, a community of people called according to His purpose, a family who have watched Him show up time and time again. Brothers and sisters linking arms to accomplish a great vision, participating in something so much bigger than themselves. CCA started as a work of faith, heart, prayer, and ministry beyond just educating students, and God showed up leading the journey. In 2008 with 87 students the Cornerstone Christian Academy board decided growth wasn’t going in the right direction quickly enough. We either needed to grow or we were going to have to close the doors of the school. In August that year Buddy Cianco bought the Arabian Horse Center and the building was vacant. I set up a meeting with Buddy at Cherry Creek Mall and CCA executed a lease agreement with the option to purchase at the end of 7 years. CCA had every intention of moving into the building at 120th & Zuni for the 2009-2010 school year, but little did we know it would take almost 24 months to get through the city process to get the building approved for school use. At the time we contracted for the building with 87 students we had no way to even afford the rent in the building, but we firmly believed God was calling us to step out in faith. Over the next two years, looking toward our move to 120th & Zuni the student body endured a split campus between the Harvest building and Crossroads Church. We doubled in student body size. Over the years, administration and the board toyed with the idea of a split campus as we grew and yet the year that we had to divide between the Harvest building and Crossroads Church we realized that having a K-12 school was integral to who we are a school family and we needed to be together on one campus. During the 2008-2010 years CCA acquired land from Gary Antonff in a partial donation near E470 and York Street. There were discussions in building our own campus versus staying at The Arabian Horse Center long-term. We ended up selling the north property to the City of Thornton, which ended up paying for a large portion of the improvements to make the Arabian Horse Center work as a school for CCA. At the time we had the north property we were just going to be a tenant at AHC, still looking for a long-term permanent home for CCA. About 2.5 years ago (2014-2015) we were again struggling financial and doubting our ability to go through with the eventual purchase of the building. The board began discussing forgoing the purchase option, with Buddy Cianco, to settle into a reduced cost long term cost… remaining a tenant forever. During this process Buddy Cianco died, and at this point discussions deteriorated between Buddy’s heirs and CCA. Their preference was to have CCA vacate the property. Ultimately they were probably aware that the building had a higher worth that we were aware. The fact that the school had the ability to perform on the original terms of the agreement, which were originally thought to be out of our ability. And yet as we faithfully made lease payments, we performed every single deal requirement. And at the end of the term have $5,000,000 equity and triple in student body size is evidence of God’s faithfulness in His leading us to growth. The board decided that we would proceed forward with the original agreement, and made the decision to push towards growth and trust God’s vision to expand our school. Ultimately knowing we needed to build a gym. We made the decision to purchase the building at the end of our 7 year term, which expired in February 2017. In August of 2016, we engaged DA Davidson to represent us to the market for bond financing for acquisition and construction for the Arabian Horse Center (School Building) and the Gym. Because of our patience, our original option price to buy the building was $5,000,000. When we did our appraisal for the financing it came in at 9.8 million. With the gymnasium the completed value was at $15,000,000. Instant Equity. In 2016-2017 the board and faculty were stretched thin and tested as they worked through the process of a financial audit, building purchase, school accreditation, loan approval, bond closing, and then construction commencement. In May 2017 the school secured a 9.6 million dollar loan for the purchase of the existing building and construction of the gym. When the building is completed in January we will have a 9.6million dollar loan and a 15 million dollar asset. Because of this momentum has increased and we look forward to that next round of growth. God has been faithful in showing up in each step along the way. Our original gym material was precast tilt up concrete, approved by the City of Westminster. After approval we received notice that the material was unavailable until December, automatically forfeit the entire winter/spring sports program. Come to find out that was due in large part the the Amazon facility taking all available precast tilt up concrete. So back in for an amendment to our ODP, and changed the material to a steel and block building. This delayed our construction by about 6 months, but it ended up providing a cost savings and got us back on track for our timeline. Construction has been so nice, knowing that our full construction loan was secured up front. At this point we are able to focus just on construction and how to pay for it. The budget process has been tumultuous over the history of CCA, as we have regularly had to rely on God and step out in faith. We have never ever missed a pay period to our teachers or our rent. Yet our board has worked tirelessly to move CCA from a budget that was negative to one that was at a minimum cash flow neutral. CCA is not looking to make money on our students and families but rather to cover our costs and increase our product offering. If there is every additional revenue it goes back into our students and faculty. CCA also still owns 10 acres near 130th and Riverdale Road in Thornton. We will look to monetize that by talking through a subdivision process to further enhance the balance sheet. We are working to fundraise for the increase in payment from where we were to where we will be. Working to operate on the same budget that we have maintained since before we started construction. Our hope is that in doing this project we are not taking funds from our core purpose of education, but rather raising $300,000 to offset the increase in cost from our construction acquisition. Please help us to maintain our budget while our student body grows to meet our new facilities. While growth continues to increase we need your help supplementing the additional expenses we have today. The school has never been on a better financial footing that we are today. It is tangible evidence that God is faithful to us as we have stepped out in faith in following Him. The reason we are building is that we believe it is concert with growth. We are building to reach more families, more students and shine God’s light and truth in education, athletics and arts to our students and community.